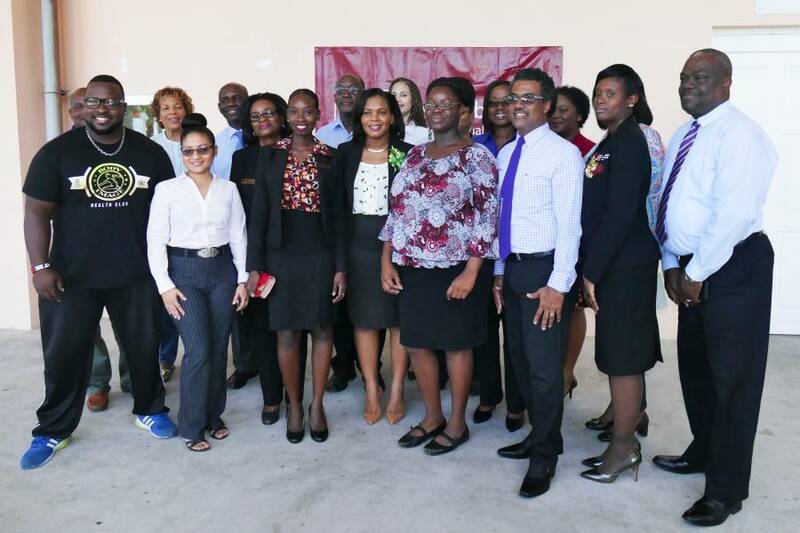 Media, Sponsors and CIBC FirstCaribbean Team Members, gathered together for the culmination of the Walk for the Cure Initiative for 2017. The short ceremony was opened by Joanna Marryshow, Administrative Assistant, Human Resources and also the leading organiser for initiatives relative to raising awareness and funds for Walk for the Cure. In her opening comments, she reminded all present of the positive actions everyone can take in terms of cancer prevention, with respect to making healthy lifestyle choices, with particular emphasis on the part that both smoking, and alcohol consumption may play in incidences of cancer. Ollivierre continued to extend an invitation to Dr Nixon, Dr McBarnette, President of the Grenada Cancer Society and Rev Osbert James, Secretary of the Grenada Cancer Society and all sponsoring companies, to attend an open forum meeting to discuss their ideas and recommendations for future fundraising events surrounding Walk for the Cure, including the walk itself. In receiving the $41,000 raised by the Walk, Dr McBarnette reminded the audience that cancer has been the leading cause of death in Grenada for the last 10 years. He commented; “We are sincerely grateful for the efforts of the bank and all persons involved with the Walk for the Cure, in providing this much needed donation. Apart from the obvious physical and emotional elements, the harsh reality is that the financial implications for cancer sufferers and their families are extremely challenging, fighting cancer requires funds.” Dr McBarnette also used the opportunity to remind attendees of the importance of living healthier lifestyles and increasing their personal awareness of cancer and its multiple causes. CIBC FirstCaribbean wishes to thank all sponsors involved with the initiative and hopes to welcome them and others back for 2018 and beyond. Sponsors included: FLOW, The Country Cold Store, Jonas Browne & Hubbard (Grenada) Ltd, National Lotteries Authority, Sandals, Sol EC Ltd, Southern Electrical Company Ltd, Andall & Associates Inc. Duty Free Holdings Grenada Ltd, GRENLEC, Body Image Health Club, Pan American Life Insurance, Spice Isle Fish House Group, St. Augustine Medical Services, Geo F Huggins & Co Ltd, Grensure Fire & General Insurances, Leslie’s Agency, Modern Photo Studio, Going Places Travel, GCNA, TATA Consultancy Services, Visa.